Every time I think and state that one of your posts is so meaningful and valuable, along comes another one such as this. The opening line ‘High performance is about inspiring not pressuring’ is fantastic!!! Why would a any leaders or organization’s seek to have less than a high performance culture, making your words regarding high performance coaching (Coaching maximizes potential, expands capacity, and enhances fulfillment) and your suggestions so valuable. Thanks again – as always!!! Thanks John. Over the last couple days I’ve been thinking about motivation vs. inspiration. I think there’s a big difference. We should aspire to the latter. Isn’t if so obvious that pressuring people is a short-term, dead-end strategy? Thanks Chiagoziem. Great question. The first things that come to mind are, tell people what’s happening, explain the vision in language that means something to them, and trust them to step up. … thoughts? Superb manual on how to get high performance through coaching. High performance requires to be inspired and not demanded. Wherever demands are made without proper mentoring and coaching, results are counter productive. Great post! Think that another that I use to energize my team is to inspire joys in their challenge. Thanks Naren. Love the idea of inspiring joys. We go further when we’re joyful. I just watched the documentary “Jodorowsky’s Dune”, which depicts a perfect, inspiring leadership by a man with a strong vision. Every member of Jodorowsky’s team said the same: he inspired them to do their best, giving them just vague guidelines on how he would see the scene and they were very much energized by the leader and his responses to their input. IMO Jodorowsky presented the perfect coaching leadership and the doc is a good watch with this perspective. Thanks jormap. I think the “vague guidelines” allows people the freedom to tap their own imagination. In the end that creates ownership. The challenge is creating an environment where people feel safe to make decisions on their own. “One eye on the scoreboard and two on the playing field”. That stands out for me. Coaching creates results by focusing on the development of people. It’s hard, but it’s not harsh. Yes, the score matters. But it’s not all that matters. All I know is this – if a leader came into my office and demanded to know why we were losing, told me what to do and otherwise treated me like I was a commodity; I’d be disengaged and I’d likely lose interest in fighting for that person, leading to an even poorer score. But show up, support me, help me self-discover what I can do differently and believe in me and support me? Well, I’ll fight to the end of time for you and the team. And I’m pretty sure that will lead to a better score than not. Thanks Alf. The three eye illustration makes me think about a three eyed monster. But, it seems to have worked to illustration a bias to the present while keeping long-term vision/mission in mind. Glad it worked. You’re nailing the ideas that help others find the energy and freedom to bring their best selves to work. We need more of that. I worked with a guy who’s philosphy was: “Tell me how to score points and then I’ll tell you how I’ll play the game.” It makes sense…he couldn’t even begin to be successful until he knew the expectations. So many times the direction is vague and pointless. I think that most people want to do well and work hard. When they aren’t given the tools or coached effectively, it’s frustrating and then people…good people…shut down. Thanks margie. You remind me of a CIO who finds energy when the end goal is clear. He enjoys discussing the path forward. Once he gets clear, you can’t stop him. Great content here – thanks! Thanks Mark. 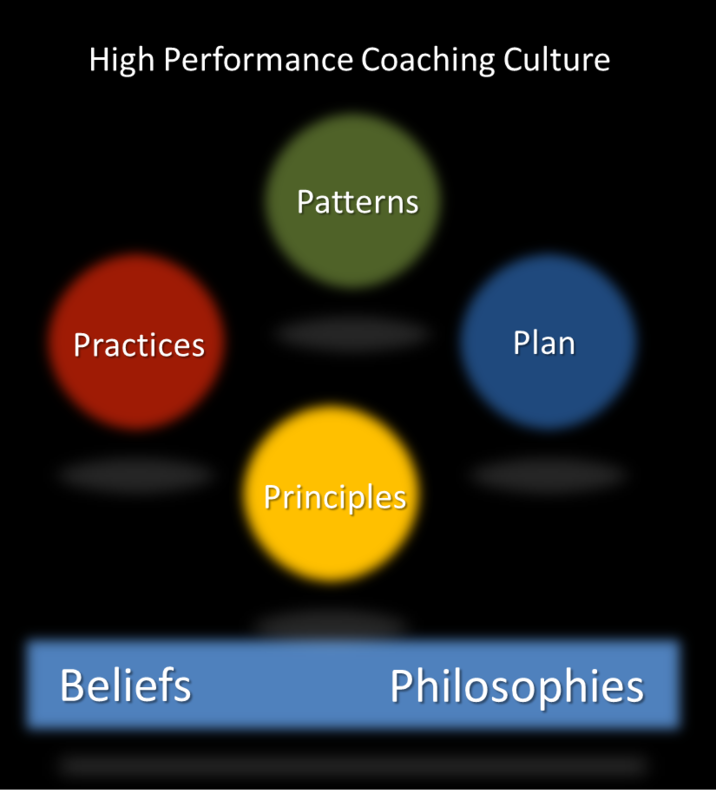 I’m currently using these 6 elements as a structure to enhance the coaching culture of an organization I work with. It may change over the next few months, but this is a starting point. Yes, I look forward to meeting you and members of your team! I admire what you are about. Very important to add diversity – research after research indicates diversity drives performance. Other great elements to organizational success are: dedication & commitment. Any time you wish to create, change or re-shape a culture, the organization as a whole needs to be dedicated to the effort and be committed to seeing it through to fruition. Like most change efforts that fail, without dedication and commitment, the lack of immediate results can detour us from achieving the vision. That is why change is often hard work. It is with strong leadership that organizations can create a clear vision and see the process through.